I know many of you reading this are wondering about this title. What does the Avatar (the air bender), a wizard from Harry Potter, and (if you know your Zelda franchise) an NPC from The Legend of Zelda have to do with anything I have ever written on this blog? Well, they were my ducks. While it can be said that owning, raising, and even loving any type of bird is an oddity. I truly loved my three ducks, like I never knew I could. Over this past weekend, the worst happened. I was out of town and returning back to work on Monday. Monday was a normal day, I went to work, had a good time, and I even stayed late to help around the work place. When I got home I was to do the usual routine which consisted of eating, maybe watching some Youtube, and taking care of my animals. This time, however, I had not seen the ducks or my chickens since that following weekend so I put them first and headed out. The first thing that was off was my hens were over in the hay… Just kind of standing there. The second thing that was off is me and my father were not greeted by a collection of quacks and flaps of my duck’s feet. The worst and most unexpected thing happened… A dog had attacked my flock. In a million different scenarios for some reason I never even thought this was a possibility. I usually thought my ducks were safe in the middle of the day as they are always out playing while it is nice in the mid-afternoon. This was just not the case this day. I first saw Tonks and I lost it. I started crying immediately, and to my surprise, because I truly never in a million years did I think I would have come to love a bird so much. I am not going to go into the details of their death or how we found them, but I just needed a place to truly get this horrible event off my chest. I am truly heart broken that I was not there when they needed me the most even though I probably could have done little to save them. I get attached to animals very easily, but these babies I have raised since day one. That is why they were so cherished. That is why I think they deserve their own blog post. A place they can be remembered and immortalized for the great birds they were and all they taught me from day one of bringing them home. This is a terrible photo, but it shows my ducks on day one of getting them set up at home. They were the sweetest and most adorable things ever! I actually promised myself that I wouldn’t get attached to them simply because I knew there was risk in raising farm animals, but it inevitably happened. I actually didn’t name them until about two months in simply because when I named them, I knew I loved them. Until we saw what they were up until their last moments. It was a magical time watching these animals grow. I watched them grow in physical size, but also in personality. It was truly amazing to see how each duck had an original personality that could not be tamed, matched, or changed. They were each so unique and that is what made me fall in love with them so easily and fast. It was a new hobby, yes, but in that hobby I found a new love for nature. This sounds incredibly cheesy, but it is true. They taught me that patience was a key aspect in the world and that anything can love and be loved back. They taught me that really sitting down and watching nature was relaxing and spiritual within itself. They were not just a hobby, but they were my pets and I spoiled them so. They would run up excitedly to greet me every time I would come to see them or feed them. It was that social aspect that really made the experience they gave me simply astounding. Teaching an animals to be social was the most crucial part of raising them. At first, they are rightfully frightened of everything around them because everything is so foreign and large. They do come around eventually when raised correctly, however. Meal worms never hurt to add to the equation either. Meal worms are the candies of the birds! Tonks especially loved his meal worms. He would hear the bag, run up, and stick his face so hard into my hand that sometimes he would miss my hand completely and end up just rubbing his face on the back of my hand. Pondo, the crested duck, was the same in that he would miss and his face would go up the closest available sleeve. Aang was always shy as she was the only female, but she would be so very vocal about receiving her share. I could go on forever about each of their personalities in great detail, but I digress. 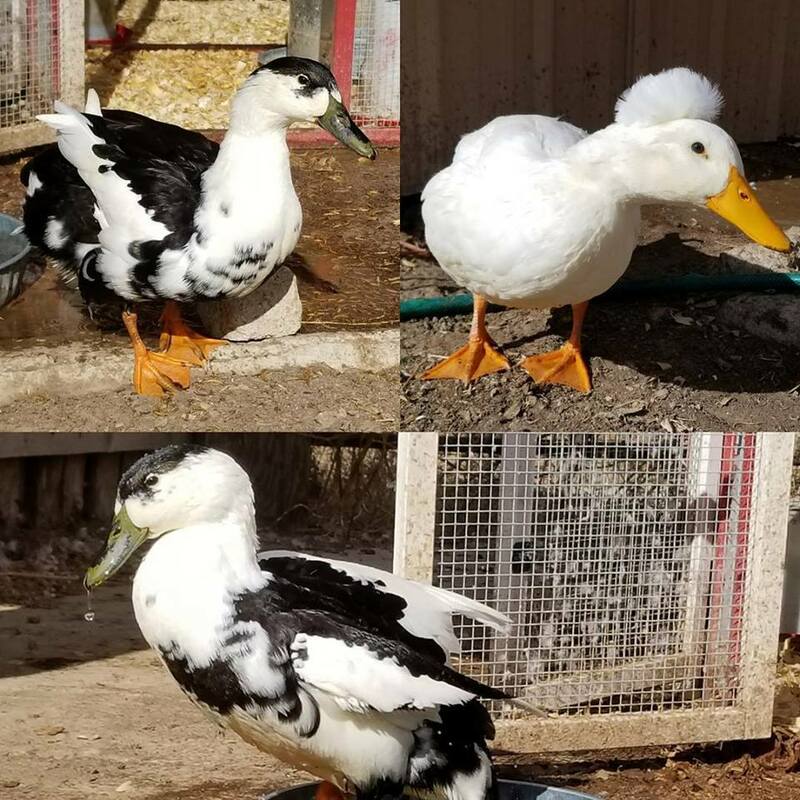 I chose to get ducks for the fun of it, the fact that they were adorable as babies, it was something that I had not done before, and I was hoping that I could receive eggs from the females. I got everything I wanted and more. When Aang first produced an egg, I was so giddy about it! I had helped create what she had created. It was an amazing feeling producing one’s own produce in such a way. Again, it was an eye opened towards the thing that we call Mother Nature. To see it up close and personal like that is taken for granted by so many people, but I just have a special connection with animals that I will not take for granted. I never once took for granted that I had and loved my birds. I know that they lived an extremely happy and good life to the end. That is what is important. My ducks did get to see some of my world as they let me in theirs. They even got to meet Santa during Christmas time (mostly because I work at a store that allows that). But they met Santa nonetheless. We even entered the County fair and won a first and second place prize! Again, I could go on forever about how much fun I had with my little pals, but in another’s eyes it won’t actually reach the meaning that they had in my life. Simply reading a post about their love won’t do them justice, but I did want to have them be known for the wonderful time they provided. They were just short of a year and they are an example of what I need to do better as a hobby farmer. However, I will never forget them as my first experience attempting this. I made a post before about my experience purchasing birds and wanting to raise them, but I could not even begin to put into words the emotions that I feel for them. They graced my life for just under a year and again, I am so terribly sorry to them for that, but that 10 months was an eye opener and a blessing. I will raise more ducks because I absolutely adore their species at this point. They are a blast. They are so silly and can be very sociable animals. Look forward to posts about this new experience in the future because it will surely be one! No animals will overshadow my first experience working with birds and Tonks, Aang, and Pondo will be remembered forever as the best ducks ever! This post is dedicated to my ducks and whatever little spirits may live inside them <3. I love them so, so much and I know they knew that. Rest in peace, babies. Tonks, Pondo, and Aang (bottom).